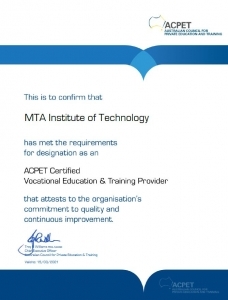 The MTA Institute is the first trade RTO in Australia to be approved under the ACPET Industry Certification Program (AICP). An “ACPET Industry Certified Member” is recognised for their educational quality, ethical practices and behaviours, continuous improvement practices and professional student services. The ACPET Industry Certification Program (AICP), process entails verification of student satisfaction and stakeholder feedback to ensure an organisation is providing high quality education with demonstration of ethical practices and behaviours. The Program is not centred on applicants demonstrating regulatory compliance, but rather the MTA Institute has confirmed its commitment to the Code of Ethics through the demonstration of ethical behaviours and practices, which is beyond regulatory compliance. Whilst the process is highly objective in analysing student enrolment data and a wide range of stakeholder feedback, the MTA Institute has demonstrated an operational level above and beyond the legislative requirements of provider standards. The Program explores a student’s journey, from their first encounter right through to graduation where the student has achieved their desired result, including marketing and recruitment, enrolment and orientation, progression and participation, student support, teaching quality and student outcomes. There is extensive evaluation of threshold test pre-requisites, governance documentation, student surveys and focus groups, graduate surveys, practitioner surveys and feedback sessions, learner support provided to students and partners and industry feedback. 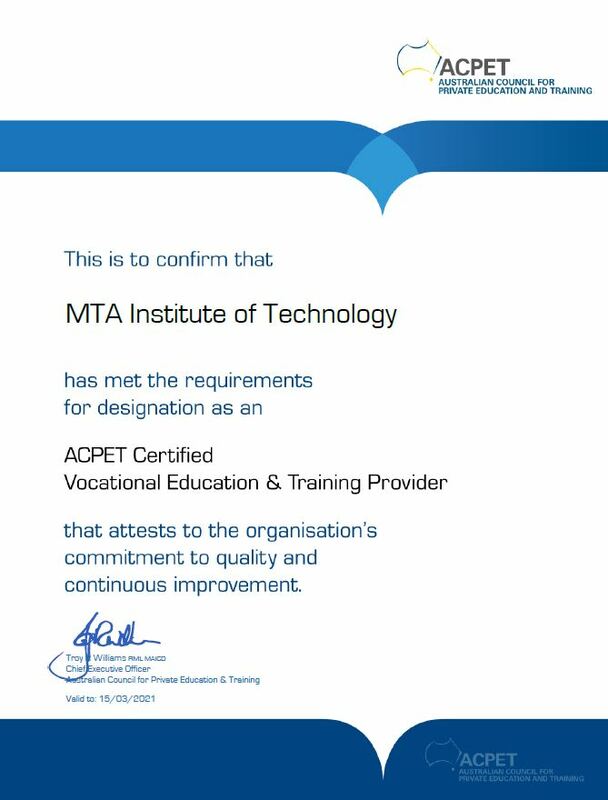 The MTA Institute is proud to be the first trade RTO to receive this certification which is also based on a 360⁰ professional feedback model that is independently undertaken. Feedback provided identified MTA Institute as an outstanding training provider committed to providing quality results to our students.